I love creating new dinner ideas to add to our rotation. One of my favorite savory combos is spinach artichoke. The two ingredients were made to be together if you ask me :) This dinner was inspired by one of my favorite dips and I think the end result turned out pretty dang good! The creamy Spinach Artichoke Sauce in this recipe is fantastic! It is so flavorful and goes perfectly over the chicken. This is one dinner you will want to make over and over again! It is seriously SO good! 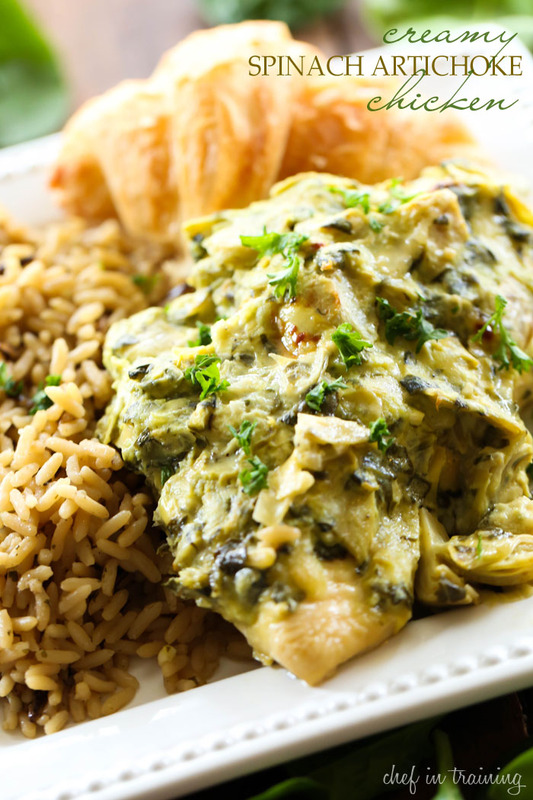 The Creamy spinach artichoke sauce over this chicken is beyond delicious! This is one dinner you will want to make over and over again! It is SO good! Place chicken in a 9x13 inch baking dish that has been sprayed with cooking spray. Bake chicken for 20 minutes at 350 degrees F.
While chicken is baking, combine parmesan cheese and cream cheese together in a large mixing bowl. Stir until well combined. Add spinach, artichokes, mozzarella, salt and pepper and mix well. Stir in milk until the mixture is moist and can be spread over the chicken easily. Remove chicken from oven and spread mixture over it. Bake an additional 20 to 25 minutes until chicken is done and completely cooked through. Oh wow. I would devour that chicken in a heartbeat and ask for seconds. Loved this chicken! I pan seared the chicken before finishing in the oven with the spinach artichoke topping. Two thumbs up! Love anything with spinach and artichoke. That rice looks delish. Do you have a recipe for that? This sounds so good. My oven is not working. I would like to know if this can be made on the stovetop or crock pot/slow cooker. Appreciate your thoughts. I am signing up today to receive your recipes. Thank you!! Would there be any changes in the preparation or baking instructions if I use thin pork chops? are the artichoke hearts fresh or from a jar? Delicious my kids ages two and nine enjoyed it too!